40th birthday party invitations - simple yet pretty to make by hand. 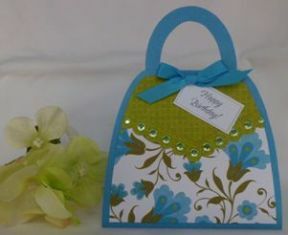 Use punches to create birthday invitations and for other homemade card ideas. 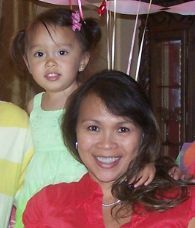 You can make your own birthday invitations for your or a family member's 40th birthday party. Pick your favorite color as an accent for the invitation and then continue the color theme for your party decorations. 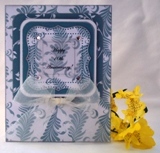 This invitation is embellished with ribbon and jewels but you can make it as simple or as complicated as you'd like. For many of my homemade card ideas like this one below, I use my computer to make the sentiment or try a card making software program called Ecard Wizard. You can pick different shapes and add them to your card page. 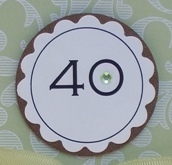 For one of the invites below, I chose a circle and added the number 40 which I included inside the circle. I also printed the text "You Are Invited" onto the card page. After I printed the circle and number 40, I punched out the circle using my scallop circle punch. I use this technique for many of my homemade greeting card ideas and once you create the proper sized circle, you can use it for lots of 40th birthday invitations as well as other handmade card making projects. Make this birthday party invitation template for a 30th, 50th and other birthday milestones. Just use your Ecard Wizard software program to type the appropriate number. 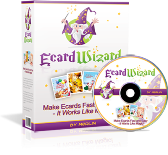 On the inside of your 40th birthday party invitations, you can add the details of the party like day, time and address and you can use Ecard Wizard to create this as well. I also used a circle punch for this birthday invitation. I placed the scallop circle over the brown circle so that the brown circle created a border around the sentiment. I used foam tape behind the brown circle to give the card dimension. 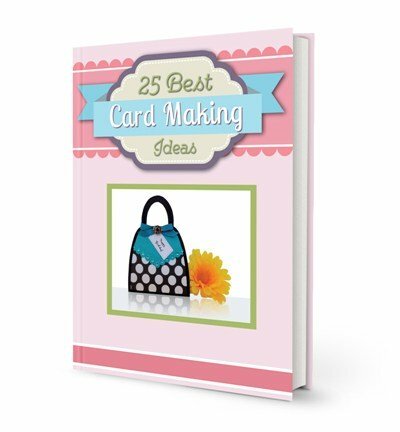 Paper card making ideas using punches allows you to come up with a variety of ideas for birthday invitations and even personalized birthday invitations. 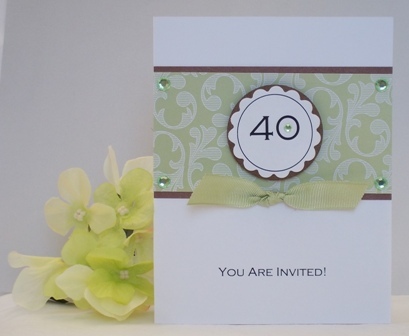 Don't forget embellishments on your 40th birthday invitation ideas. I added green adhesive gems along all four corners on the pattern paper and a smaller sized gem inside the middle of the number 0. I tied a knot on the ribbon and cut the ends at an angle. I try to make birthday invitations simple since you may have to make lots of them. Make a lot of circles with the year on one page so that you can save paper. Don't forget to spread out the circles so there's enough space between them so you can punch them out properly. 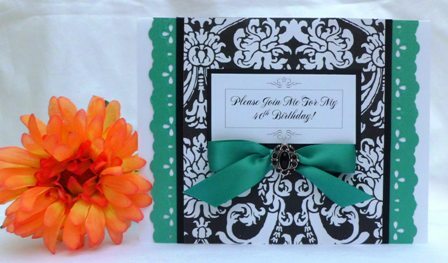 I used blank cards for many of my cardmaking ideas, especially for my birthday invitation ideas since they usually come with envelopes. The cards are already cut and scored which saves time. 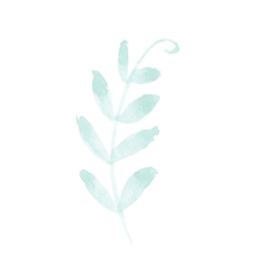 White cards are easy to find and inexpensive but try to purchase them when there is sale since you'll need a lot of cards with envelopes. Don't be afraid to make birthday invitations by hand. If you follow this idea, you can create a beautiful birthday invitation.